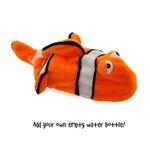 Stuff some fun into your dogs day with the Sea Life Plush Bottle Dog Toy Clownfish! I am impressed with this company so far. Very friendly staff and very willing to work with you to make things right. The website is very user friendly and sprinkled with humor making shopping a pleasant experience. 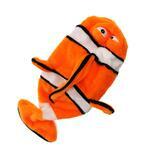 This company seems to listen to their customers and want their customers completely satisfied with their purchase. A very simple, honest business philosophy and it works for me!! !